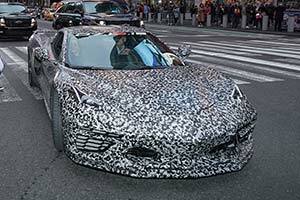 During the 2019 New York Auto Show, Chevrolet offered the first glimpse of the all-new, eighth generation Corvette. Wearing a camouflage livery, the 'C8' was briefly driven on the streets of the 'Big Apple'. On the doors, the official, mid-July release date of the car was announced. Although no further details were released, it was very obvious that the new Corvette will be mid-engined.